We truly believe that there’s nothing that can’t be improved with mozzarella. Even mozzarella. When in doubt, add (more) mozzarella. Fresh and uncooked with chopped tomatoes, on pizza, even on plantains, it’s absolutely gorgeous. 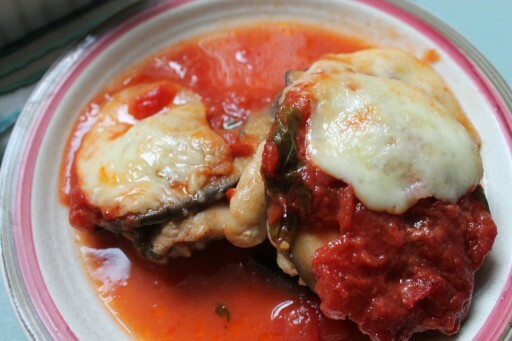 So you know Melanzane alla Parmigiana, you’ve seen our Plaintain alla Parmigiana and now have a look at our equally yummy Chicken and Aubergine Bake which we consider part of the same family. So yum and so portable – you can bring it to a family potluck or even freeze it for a later date. When we were teenagers and cooked for ourselves on occasion, bakes were our go-to dish because you can partially cook all of the ingredients, chuck them into a baking dish and forget about it for 20 minutes. They’re terribly easy and impressive. Especially if you add mozzarella. We appreciate that this isn’t really a summer dish, but hey, if you’re watching your weight, you might notice that it’s free of starches. You’ll feel full, but it’ll be down to the protein and fat, and you shouldn’t feel sleepy or weighed down. And more importantly, you’ll have room for ice cream. Priorities, people. In a large frying pan, heat about 1 tbsp oil. Add the chicken thighs and cook on both sides for 5 minutes each so that the outside is seared. Leave the chicken thighs to one side. Add a little more oil (maybe 1 tbsp) to the frying pan and heat. Add the slices of aubergine and fry on each side, 1-2 minutes each until cooked. In a medium baking dish, add the chicken thighs and lay the aubergine slices on top of the chicken thighs. In a small saucepan, add the tinned tomatoes, parsley, salt, pepper and garlic powder. Heat until boiling and then simmer for 10 minutes gently. Preheat the oven to 180C (fan assisted). Pour the tomato sauce on top of the aubergine slices. 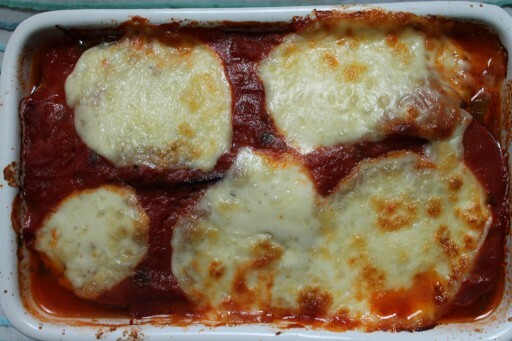 Add the mozzarella slices on top. Bake for 25 minutes until the top is golden brown. It is important that you check that the chicken is cooked through.